In digging through my treasure trove of buried teas i came across today’s gem. A Tea Source tea that i was able to pick up and promptly forget about at Grand Rapid’s Coffee Roasters, Guangxi Special is better known as Guangxi Black Snail. Unfortunately that’s kind of where the story stops. There hasn’t been a great deal written about this uber rare tea previously (in English). Black Snail is usually grown (and hand curled) in Yunnan, but Guangxi occasionally exports one. Apart from The Tea Source, the only other major vendor to carry Guangxi’s Black Snail in the past has been Upton (though they don’t have one currently). Putting that aside, Guangxi Black teas that aren’t either Heicha or Osthmanthus are themselves quite rare and Tea Source has two (I hadn’t even come across one before today). I’m blown away. Well done Tea Source! In aroma Guangxi Special Black is more like a Golden Yunnan (which gives me some ideas for tomorrow’s review…) with a great deal of wet Tippy malt with a hint of spice. The liquor color cups to a gorgeous deep hazelnut. I’m not as sold on the flavor but it does have a great deal of character. 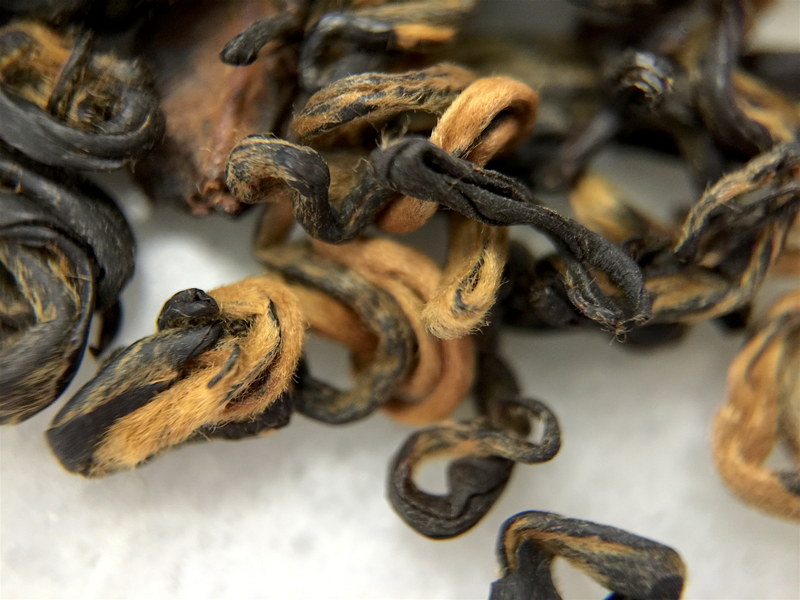 The taste of this rare Guangxi Black resembles a rich 2nd flush TGFOP Assam or Nilgiri: malty with a goodly amount of powdery dark chocolate-like Tip. I don’t think I’d call it a FTGFOP because it has a slightly rougher, curly Black aftertaste and the spent tea doesn’t unfurl the same way. In texture, Guangxi Special is essentially Golden Tip that tickles the tongue from the tip (no pun intended) to the dorsal ridges. Although it’s not the most refined or even the most Tippy, in uniqueness Guangxi Special really shines. I’m willing to bet you won’t be able to get your hands on a better Guangxi Tippy Black right now if you tried. Guangxi Special (TeaSource) ~ loose leaf by Jocilyn Mors is licensed under a Creative Commons Attribution-ShareAlike 4.0 International License. Guangxi Special (TeaSource) ~ loose leaf macro by Jocilyn Mors is licensed under a Creative Commons Attribution-ShareAlike 4.0 International License. Guangxi Special (TeaSource) ~ spent by Jocilyn Mors is licensed under a Creative Commons Attribution-ShareAlike 4.0 International License. Guangxi Special (TeaSource) ~ liquor by Jocilyn Mors is licensed under a Creative Commons Attribution-ShareAlike 4.0 International License.